Irish Gaelic for "Honor, Remember, Represent, Celebrate"
For many years, members of the Emerald Society Firefighters of Washington, DC dreamed of forming their own fire service pipe band. Tragic events from multiple "Line of Duty Deaths" like September 11th, 2001 and the ability to play for one of its own served as the catalyst to form an all DC Firefighter Pipe and Drum band. In February 2002, under the leadership of Henry Welsh, Robert Purdy, and Dave Hollinger, approximately 40 DC Firefighters turned out for the first band practice. One year later the band was officially marching down Constitution Avenue during the 2003 Washington, DC Saint Patrick's Day Parade. In the summer of 2012 the band recorded their first CD in conjunction with their 10th anniversary. "Keeping Tradition Alive" was announced as the CD title and the band recorded 16 tracks with over 40 members present. Following the recording session were many months of listening to sample tracks of music and working with a Professional Music Engineer at Lion Fox Studios in Silver Spring MD. The production of the CD was made by a facility up in New Jersey. So we are proud to say that this CD is 100% Made in the USA! Over the years, band members have put in a lot of hours practicing and performing all over the region. We do this with pride and to honor all those we work with on the job or those who have retired in the past. We dedicate “Keeping Tradition Alive” to all who live by this valuable DCFD motto! 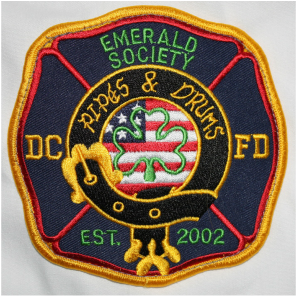 The membership of the DCFD Emerald Society Pipe and Drum Band is distinctive in that all members are active or retired DC Firefighters. These members range from those recently graduated from the Training Academy to retirees who have dedicated thirty plus years of service.